One of my greatest regrets as a film lover is missing George Miller’s Mad Max: Fury Road on the big screen, a horrendous error on my part that I intend to correct this New Year’s Eve. If ever there’s a movie that needs to be seen in a theater with plenty of sound, it’s this outlandishly inventive and exciting two-hour long car chase. The film will be screened on New Year’s Eve in Kino Art. See the cinema’s programme. I was never a huge fan of the original Mad Max trilogy, but the fourth installment in Miller’s dystopian franchise totally blew my mind. After two decades of being underwhelmed by Hollywood blockbusters that were simultaneously bloated and diminished by soulless CGI, Fury Road is the genuine article. It’s a blood-and-thunder thrill ride which revels in practical effects over computer-generated ones, packed with real stuntmen doing crazy things while clinging to the sides of real vehicles. It also has plenty of heart, directed by a man who wants you to care why Tom Hardy is fighting a feral nutjob in a gimp mask on top of an armored eighteen-wheeler, which is careening at top speed through a post-apocalyptic hellscape. Miller is also a man in total control of his craft – here is a rare action movie where you always know exactly where everyone is, what direction they’re moving in, what they’re doing, and why, even in the most elaborate and intense sequences of the movie. When you see movie making this assured, it’s crazy to think that the only other feature films Miller directed in the previous twenty years were a talking pig film (Babe: Pig in the City) and two CGI dancing penguin flicks (Happy Feet 1 & 2). This was the guy Warner Bros gave $150 million and carte blanche to resurrect the Mad Max franchise, thirty years after the last installment, Beyond the Thunderdome (aka: “The one with Tina Turner”.) The project spent two decades in development hell, but once Miller got the green light, he handed someone his beer and directed the thing like he’d dreamed every minutest detail many times over in the intervening years. Fury Road picks up with an all-new Max Rockatansky (Tom Hardy), a monosyllabic survivor in a post-apocalyptic wasteland. He’s immediately captured by the War Boys, the maniacal white-painted shock troops of a pestilent tyrant, Immortan Joe (Hugh Keays-Byrne, who played the chief bad guy in the original 1979 film). Joe lords it over his wretched followers from a towering rock formation known as The Citadel, where he rations out water and spouts self-aggrandizing speeches to the impoverished rabble. His War Boys are terminally sick and have a vampiric need for healthy human blood, so Max becomes a “blood bag” for the hyperactive Nux (Nicholas Hoult). The main thrust of the plot kicks off when Imperator Furiosa (Charlize Theron), a fearsome one-armed warrior working for Joe, makes an unauthorized detour from her truck route to pick up fuel. Immortan Joe discovers that Furiosa has done a runner with his five wives – Joe’s clan are a bunch of depraved malformed freaks, and he uses his “wives” as breeders, in the hope of producing a healthy heir to his throne. Enraged, Joe and his entire army set off in pursuit. That’s pretty much it as far as plot goes – once Max, Nux and Furiosa’s fates become entwined, the next hour and a half is one long teeth-rattling car chase. Theron’s Furiosa, all pedal to the metal and steely gaze, is more than a match for Hardy’s Max, and deserves a place among the great action icons. Joe is a brilliantly repellent villain, in constant pursuit with his demented clan in a wild array of hybrid vehicles. 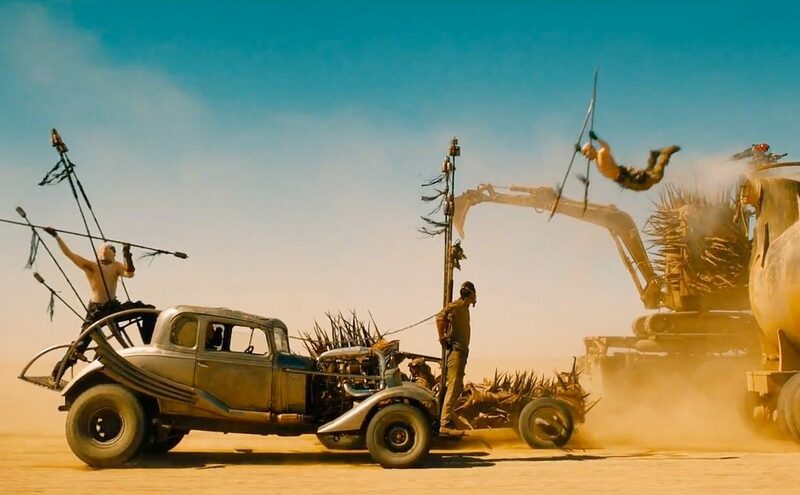 The caravan includes a mobile stage for the film’s most memorable creation, the Doof Warrior – a mutant rockstar keeping the tempo for the war party by shredding solos on his flame-throwing guitar. With all this going on, Max is relegated to the role of Furiosa’s sidekick, although he still has plenty to say in the action stakes. It’s tricky writing about Fury Road without the review just turning into a laundry list of superlatives. Every aspect of the film looks like a labour of love from everyone involved, and the incredible production design brings Miller’s berserk vision to vivid, pulsating life. While it may be the fourth film in a franchise and bear the Warner Bros logo, it is toweringly, overwhelmingly its own thing, a fully realised work of art that is jaw-dropping in detail, imagination and scope. In short, it’s one of the greatest action movies ever made. So if you’re at a loose end this New Year’s Eve, you could do a lot worse than to see Fury Road on the big screen. Or if you’ve got a party to go to later in the evening, grab a few beers and let the Doof Warrior get you revved up for the night’s festivities!